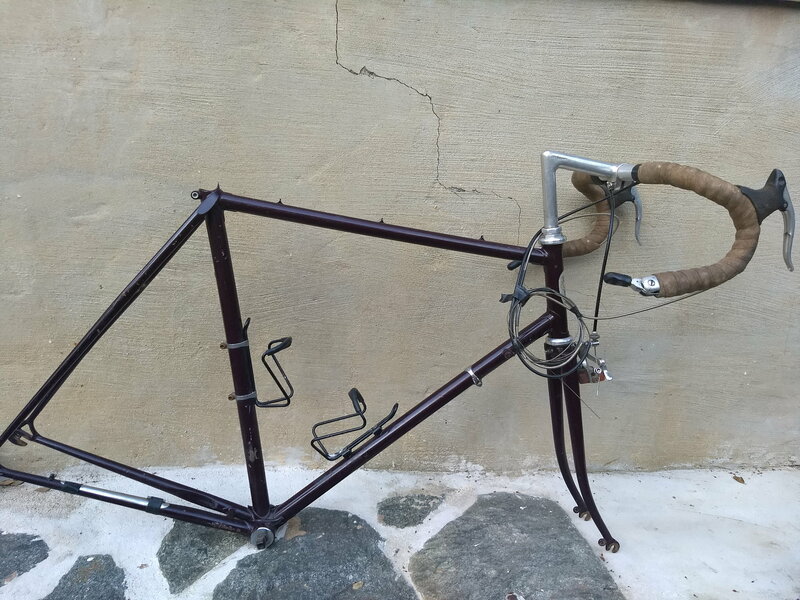 Another "can this be saved" thread, I had this frame dropped off yesterday for $30, I'll use the few components left on it. Before I bin the rest, I'd like to get some opinions. 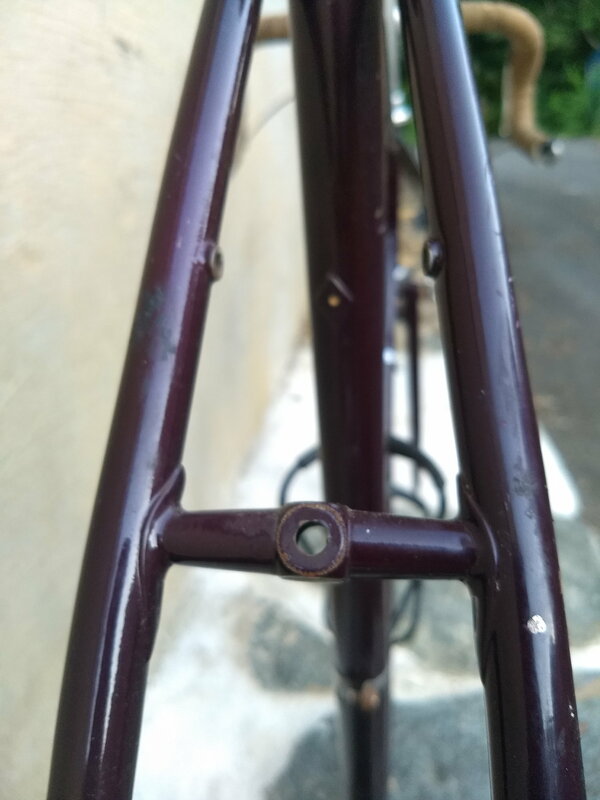 Also, recommendations for DC area frame builders. 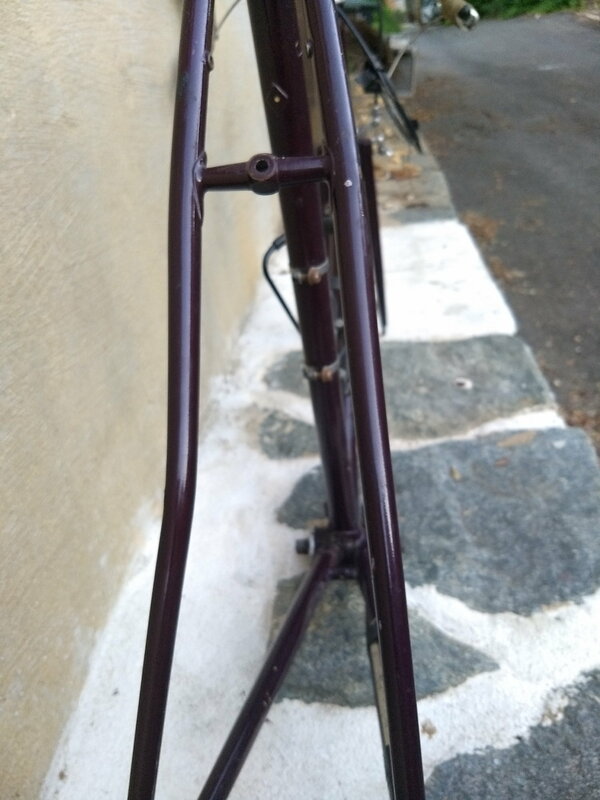 so, here we are: Proteus headbadge, never seen before on other Proteus frames on bikeforums. No serial number that I can find. Campagnolo fork ends, nice lightweight tubing (no stickers). This looks like it was powder coated or painted after the dt shifter bosses were hacked. Mobile upload not working? Here's the damage. We'll, that's the question... It's a nice frame, probably 531, most of Proteus's kits were. I bought it because the price was right and it had a unique headbadge. Since it has no serial number it was probably a kit and assembled by a beginner builder. If it was a shop built bike itdi be worth more. I would personally cap repair costs at around 150, or put it in the attic until I can try it myself. I just replied to your thread in C&V. I would say it's highly unlikely that it's a kit. They did use that headbadge, and they didn't sell them. Having said that, it's not worth all that much. 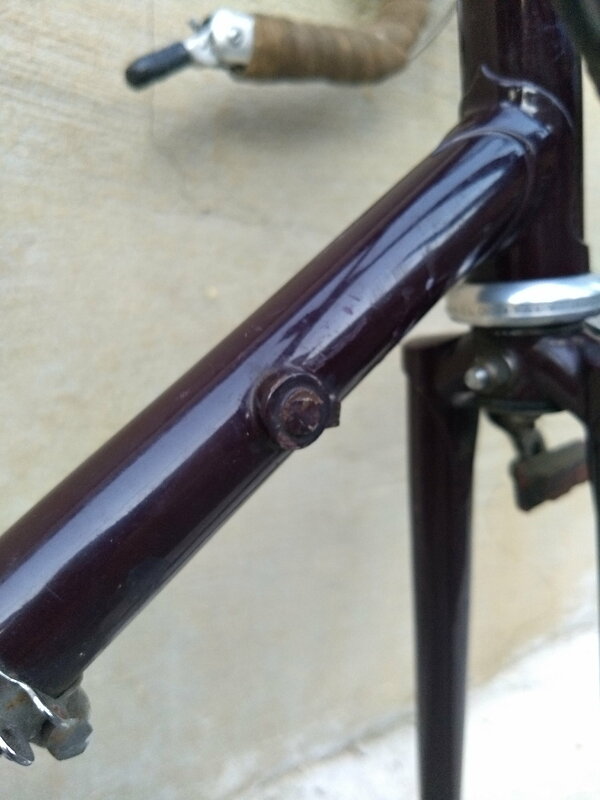 If the seat stay doesn't crack badly when straightened, I would be tempted to fill the dent with bronze. I would ignore the seat tube dents, and file the remaining dt shifter bosses off. 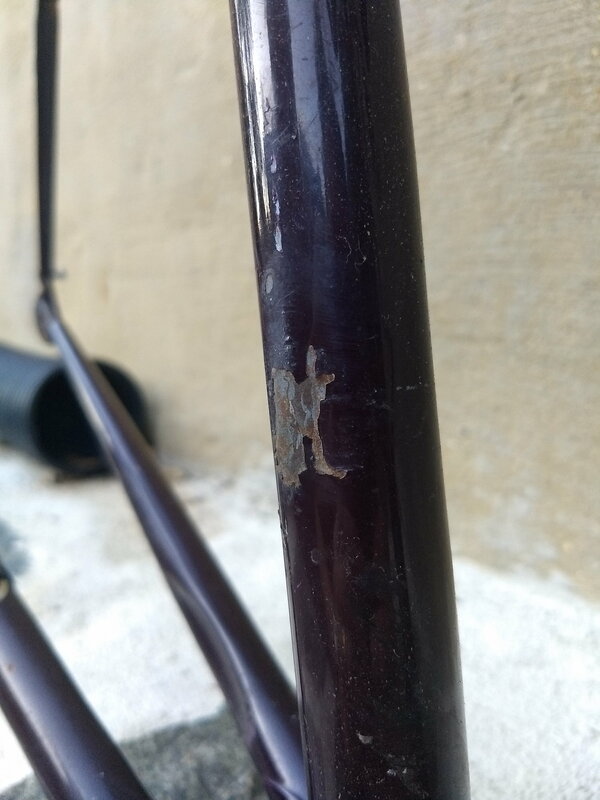 If you have to pay to get the seat stay replaced, it's a failed experiment unless you find a framebuilder that likes to gift their time to people. Thanks for all the advice. I think I'll try the repairs, keeping a close eye on cracking. Hopefully with the assistance of someone with a frame jig or a good space to make sure everything is aligned properly afterwards. 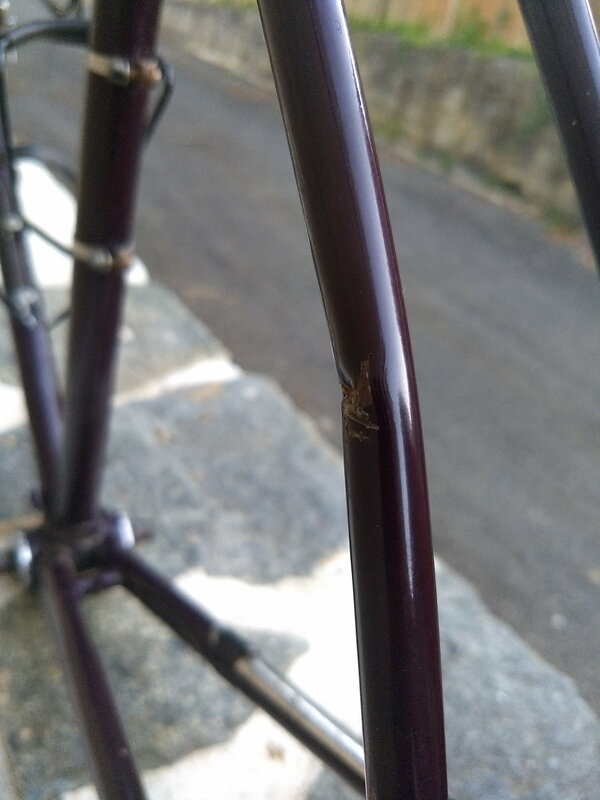 If the seat stay does crack badly, I'll put it in the attic until I have time to take on a learning project, and do the replacement myself. there are alternate repair methods with various degrees of hackery involved. I might be tempted to put a splitter there. Or for more ugliness, a split tube splice.